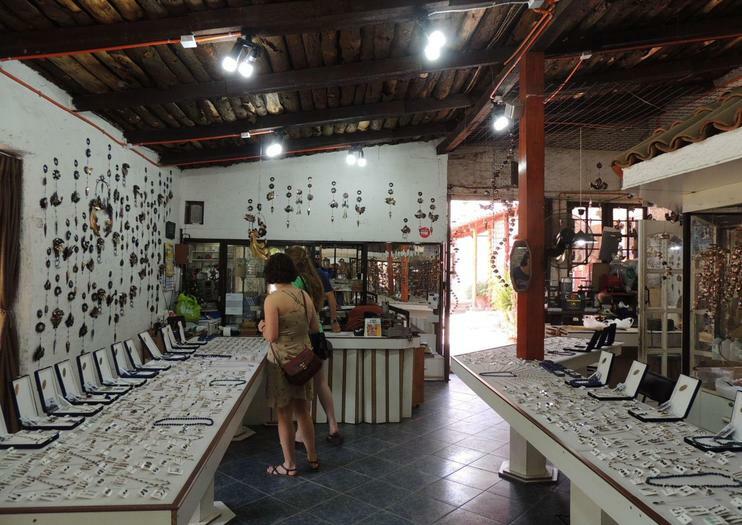 A charming old cloister has been turned into a crafts center that is popular with tourists and locals alike. The whitewashed walls and dirt paths bring a bit of charming country living into Santiago, helped along by cages with birds as fantastical as peacocks (who often put on a show), and the occasional cat that wanders in and out of shops. In independently-owned shops, the main items on offer here are lapis lazuli (a blue stone only found in Afghanistan and Chile) jewelry, thick woven sweaters and shawls, painted tiles, terra cotta dishes and three-legged pigs from Pomaire, as well as thrown pottery. What makes Los Dominicos extra special, besides the tranquil atmosphere is that the artisans are often at work when you visit their shops, and are happy to explain what they’re working on, or how items are made. Los Dominicos has two traditional restaurants, where you can often see families enjoying empanadas or pastel de choclo, a traditional meat and chicken pie with a layer of creamy corn baked on top. The busiest days at Los Dominicos are Saturdays and Sundays. It is never truly packed, but if you prefer more tranquility (though some shops may be closed), try to come mid-week. Discover Chile’s passion for arts and crafts on this unique 6-hour tour of Los Dominicos village from Santiago, including hotel pick-up. Admire innovative open-air art installations at the Las Condes sculpture park, then browse the artisan village of Los Dominicos, famed for its quality handicrafts. Admire local specialties like Alpaca wool clothing and lapis lazuli jewelry; watch traditional techniques of weaving, carpentry and metalwork; or shop for handmade, one-of-a-kind souvenirs.